Waltzing Matilda is a towering figure in the national psyche, however, his origin is something else entirely. Most Australians would never use the words “jumbuck”, “coolabah tree”, “matilda” or “tucker-bug” in ordinary conversation, although it’s not that unusual enough to hear people offer to “boil the billy” when they’re offering you a cup of tea. The words of course are heard in our unofficial national anthem Waltzing Matilda, a song about an itinerant labourer who sets up camp under a eucalyptus tree by a waterhole, makes a pot of tea and then steals a sheep. When the sheep’s owner calls on three law enforcement officers to arrest the man, rather than submit to such a humiliation he commits suicide by throwing himself into that waterhole. The original words to Waltzing Matilda were written in 1895 by Andrew Barton “Banjo” Paterson, one of Australia’s most loved bush poets. His poetry tends to focus on the outback and the hardships of life in the bush. Among his most famous works are The Man From Snowy River and Clancy of the Overflow, ballads with intrepid hard-working men at their centre. The swagman protagonist of Waltzing Matilda is not a champion like Clancy or “the Man”, but he’s every bit as Australian. But where did the story come from? Historians tend to agree that Paterson was inspired by real-life events at a couple of pastoral stations in Queensland. The first was the 1891 Great Shearers’ Strike, a major event in Australian industrial relations history. For nearly four months, shearers on a number of central Queensland stations went on strike to protest against having their wages reduced when their working conditions were already very poor. This was a case of labourers uniting against the oppression of the working classes. Before this time there hadn’t really been an organised labour movement in Australia. Pastoralists retaliated by bringing in non-union labour to take their jobs, and what’s more they had the support and protection of the police. When unionists protested, many were arrested and some men were sentenced to three years’ imprisonment. It was bitter period resulting in a great deal of bad blood between workers and bosses and it was further exacerbated when in 1894, shearers at another station burned down the shearing shed to protest against their low wages. Around 100 sheep were killed, shots were fired and the situation became quite violent. 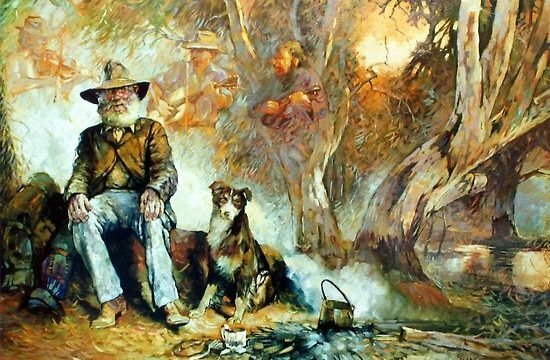 The swagman’s anti-authoritarian action appeals to our sense of the Australian character, a national ethos if you will—that we’d rather die than submit to an unjust authority. It was events at this station, Dagworth, that gave us our swagman. According to the stories, one of the shearers ran off only to be pursued by the station’s owner and three police troopers. He apparently shot himself beside a nearby billabong rather than be captured. Paterson heard the story from Dagworth’s station owner Bob McPherson. One night McPherson’s daughter Christina was playing her version of an old Scottish song called The Craigielee March and Paterson decided to tell the shearer’s tale setting it to that melody. He found the tune “whimsical” so perhaps Christina played her melody at a slower somewhat more wistful tempo than at the usual cheery upbeat tempo we’re more familiar with. That buoyant rhythm is at variance with the grimness of the story. With wool prices fluctuating and the rural sector suffering, it became more and more common to see itinerant rural labourers, shearers among them, moving around from place to place (“waltzing”) in search of work. They had few personal belongings, travelling with the bare essentials, including a billy, a can for boiling water over an open fire; and a “matilda” or swag, a bed roll that was easily wrapped up and slung across their backs. It was this item that gave these men the name “swagmen”. The term “sundowner” is also applied to these wandering workers because they’d set up their modest camps at sundown. When Paterson wrote the words to Waltzing Matilda, it’s probably fair to say he was feeling sympathetic to the shearers. There had always been something of a class system in early Australia, hard to avoid when the place was colonised by convicts, many of whom were transported to the penal colony of New South Wales for very petty offences. Squatters—people, who from the 1820s onwards, claimed large areas of land without any legal entitlement to it so they could establish livestock farms—were fast becoming an affluent socio-economic section of colonial society. Their wealth was based on the hard work of underpaid labourers. But by the latter years of the century, public opinion towards them was changing in favour of a more egalitarian society. The Great Shearers’ Strike of 1891 and what followed led to the formation of a political movement designed to represent workers and ultimately the establishment of the Australian Labor Party, but that’s a story for another time. Advance Australia Fair – or not? Does the outrage over the anthem protest indicate our aggressive nationalism? Australia finally shed the shackles of colonial status in 1901 when it became the Commonwealth of Australia, but it would take more than federation to rid us of our resentment of imposed authority. To some extent, Waltzing Matilda exemplifies some of this resentment. Our swagman is poor so he steals a sheep (a “jumbuck”) that he can later cook and eat at his campsite under a gum tree. The wealthy squatter doesn’t hesitate to set the troopers onto him; the swagman knows he won’t get a fair go under the prevailing justice system so he chooses to take his own life. There’s a real poignancy in the final verse when we hear that the swagman’s ghost haunts the billabong where he died. The swagman’s anti-authoritarian action, while extreme, also appeals to our sense of the Australian character, a national ethos if you will—that we’d rather die than submit to an unjust authority as represented by the troopers who weren’t necessarily the epitome of objectivity. Swaggies thus have something of a hallowed place in our folklore. In the early years of the twentieth century, the words to Waltzing Matilda were altered slightly by Marie Cowan and used by the Billy Tea Company to advertise their tea and thus the song became famous around the country. Many Australians don’t know all the words to our national anthem Advance Australia Fair. In marked contrast, there wouldn’t many Australians who don’t know all the words to Waltzing Matilda. It’s a favourite at sing-alongs, played around campfires across the nation, in school assemblies, at sporting events, military marches, music festivals, you name it. There are arrangements for symphony orchestras, jazz interpretations, dance band versions, folk, punk and choral versions. According to the National Film and Sound Archive, Waltzing Matilda is the most recorded Australian song ever, and quite possibly the most loved. There are a number of versions of the song each with slightly varied lyrics and even melodies, but the message is the same: the underdog refusing to be beaten into submission. The line “Who’ll come a-waltzing matilda with me?” is a call to stand up for the principles you believe in, even if that means dying for them. It’s a call to live in freedom, unhindered by unnecessary possessions or obligations, an encouragement to enjoy the simple things in life like sitting under a tree and drinking a nice cup of tea. Boil the billy, will you?